Marcel Breuer Wassily chair or B3 chair made by Gavina Italy, first manufactured by Thonet in 1920. After produced by Gavina till 1968 Knoll bought the Gavina Group of Bologna. This brought all of Breuer's design into the Knoll catalog. So this chair is form the period 1960. Tubular structure with white thick canvas upholstery. 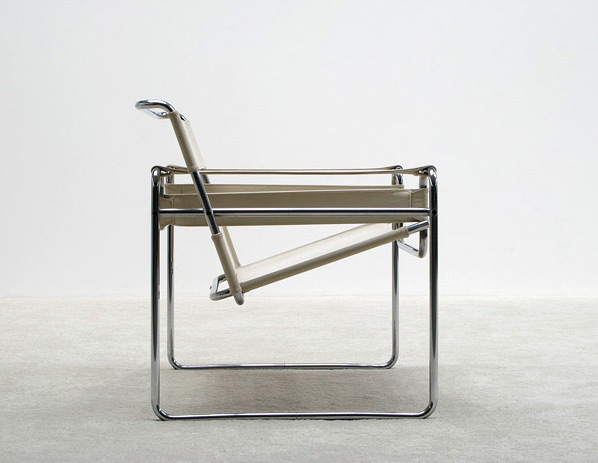 Chaise de Marcel Breuer, modèle Wassily ou B3, production par Gavina Italie, d'abord construit par Thonet en 1920. Entre les années 50 et 1968 par Gavina. 1968 le Groupe Knoll acheté l'usine Gavina et licence de Marcel Breuer. Période de fabrication de cette chaise environ 1960. Structure tubulaire avec tapisserie d'ameublement en toile blanche.